I have always been a fan of clear gel-type shampoos owing to the nature of my hair. My hair type is naturally fine-straight hair which lacks volume. An oily scalp and drier ends makes things worse for me since a flat crown can ruin any look. Thick creamy shampoos are a big NO-NO for me. 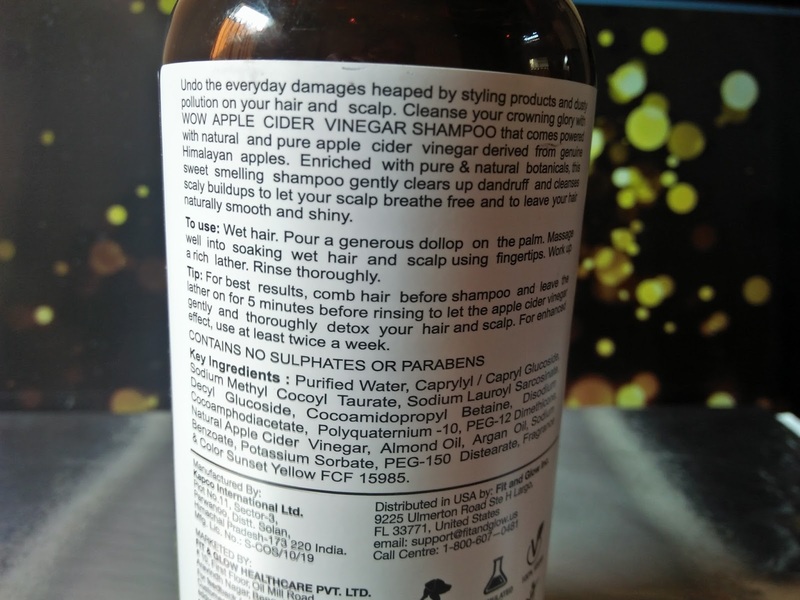 So, when I came across this brand in Amazon(dot)in, which claimed being Paraben and sulphate free and having apple cider vinegar as main ingredient, I decided to give it a try. Apple cider vinegar is known for having antibacterial and antifungal properties which cleanses scalp of any dandruff or infection and also balances pH level of the scalp and hair which in turn promotes healthy hair growth. Let’s see if all those promises worked for me or not. Product claim: Undo the everyday damages heaped by styling products and dusty pollution on your hair and scalp. 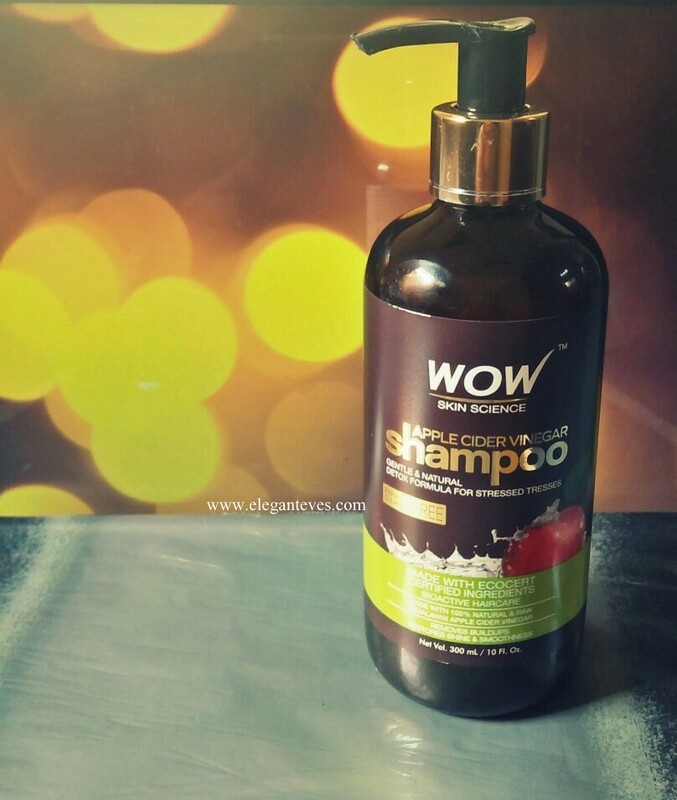 Cleanse your crowning glory with WOW Apple Cider Vinegar Shampoo that comes powered with natural and pure Apple Cider Vinegar derived from genuine Himalayan apples. Enriched with Pure and natural botanicals, this sweet smelling shampoo gently clears up dandruff and cleanses scaly build-ups to let your scalp breathe free and to leave your hair naturally smooth and shiny. 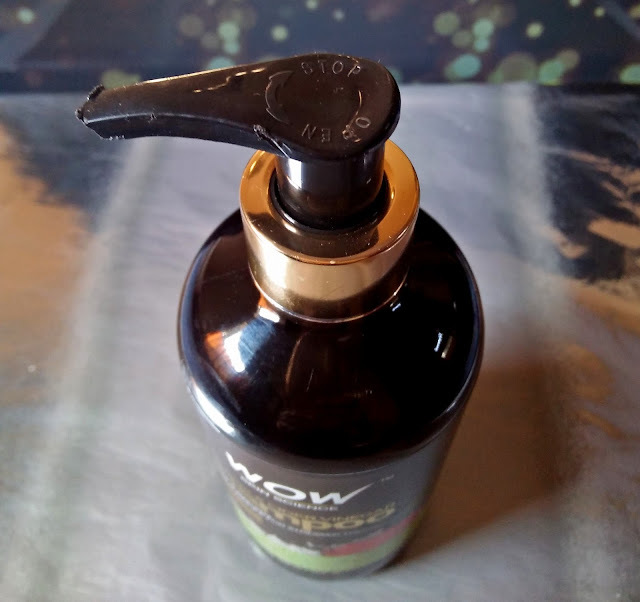 Packaging: The shampoo comes in a dark tinted plastic bottle with a very good pump dispenser which can be twisted for opening and closing the pump lock. 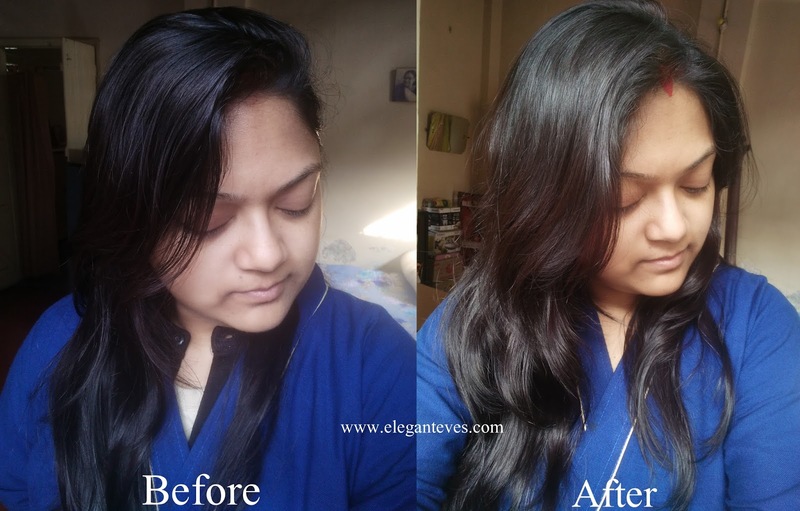 My take: The first thing which made me happy with the product was the clear gel type shampoo which pumped out. It was an almost runny pale pinkish translucent gel and nothing like those thick white creamy shampoos which give me nightmare! The fragrance is extremely mild and reminds you of fresh apple juice. There is no strong “detergent-like” smell which most commercial shampoos have. I used it on my third-day hair (Hair on third day after last shampoo session, without any oiling). One thing which I noticed apart from the smell was that, unlike shampoos like Head&Shoulders or Sunsilk which give your instant lather as soon as it touches your wet hair, with this shampoo you need to “work up” the lather with some extra water. 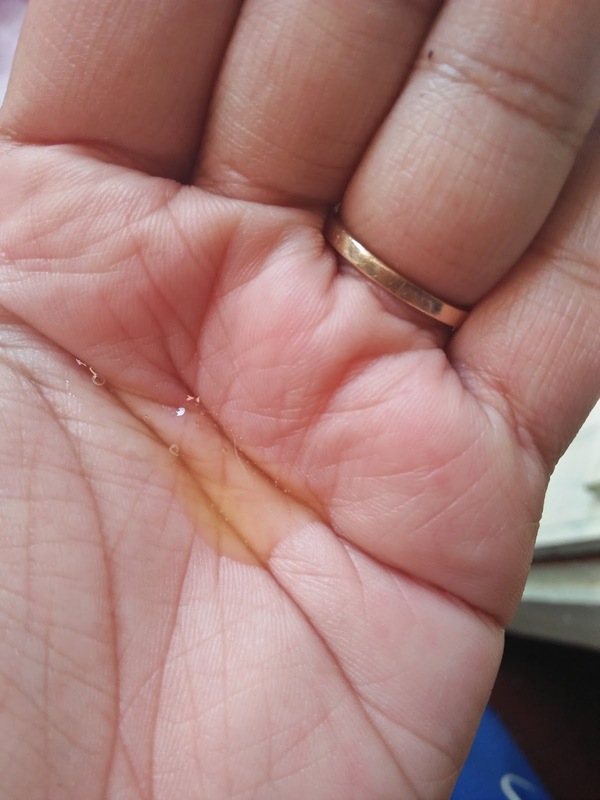 So, after I massaged two pumpful of WOW Apple Cider Vinegar Shampoo on my scalp, I used some extra water to work up the lather on the scalp and then proceeded to massage the lather on my hair strands. Then as advised, I let the lather rest on my hair and scalp while I completed the rest of my shower time using face wash and soaping myself. In about 2-3 minutes I washed off the shampoo (I avoided 5 minute advice in fear of drying out hair too much). The shampoo rinsed off quite easily and there was no “slippery-soapy” feel after the wash. I didn’t use conditioner since I wanted to check the efficacy of the shampoo alone. I towel-dried my hair and let it air-dry after that. Below is the Before/After picture. The first picture was taken just before I went for my bath, and the second is after my hair air-dried post using this shampoo. There was no hair fall during the usage as well as none during combing. Do I need to say how much I love this shampoo anymore? :D This is the amount of lightness and bounce my thin hair gets after using WOW Apple Cider Vinegar Shampoo without any blow-drying or hair spray. Also noticeable is that there is no dryness in hair even without using conditioner. My hair smells fresh and the scalp feels squeaky clean. I have found my Holy Grail shampoo! 1. This shampoo will not be liked by people who are accustomed to rich lather which shampoos like Head & Shoulders give. 3. 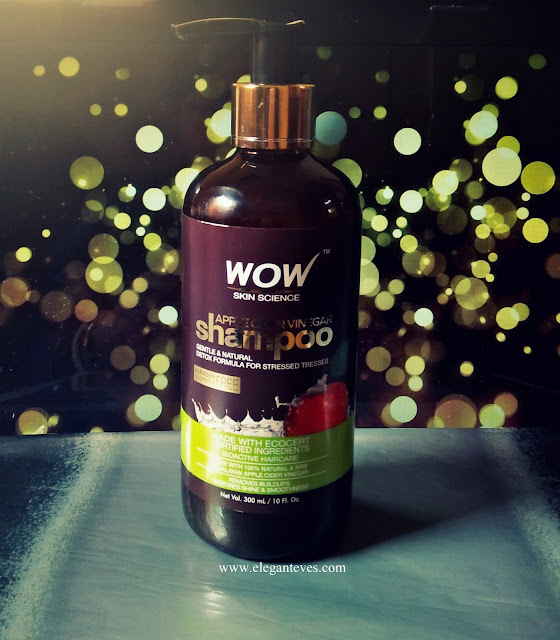 This shampoo is perfect for people with naturally thin hair, normal-oily scalp, greasy dandruff and people looking to detox hair of product build-ups. Have you used it? How did your hair like it? ?